Hello, I'm having a weird problem. I'm currently writing and reading Exif codes without problems using GdPictureImaging. However I need to write a number into the TagExifUserComment field (don't ask why, customer request). 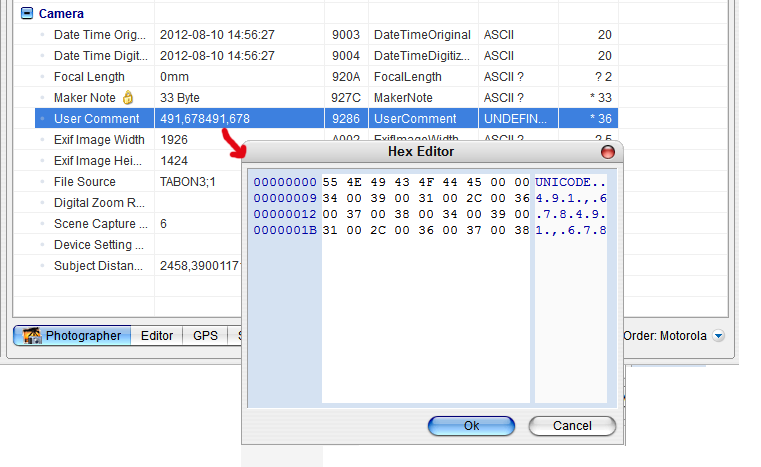 The number is written but using any Exif viewer (Opanda, Irfanview...) the value found is "UNICODE ASCII <number>" and the type of the field is "UNDEFINED". if I do the same in a field like "tagArtist" I don't have this result, it seems to be something related to TagExifUserComment only. Lucky me, that's the field I need. This strange behaviour causes a problem, since the other applications I'm interfacing with tries to read a string ans parse it as a number. The TIFF Tag UserComment should be of the type UNDEFINED and containing 8 first bytes defining the encoding. And GdPicture correctly do that. If you attach an example of your image I will confirm you if there any ano possible issue or not. 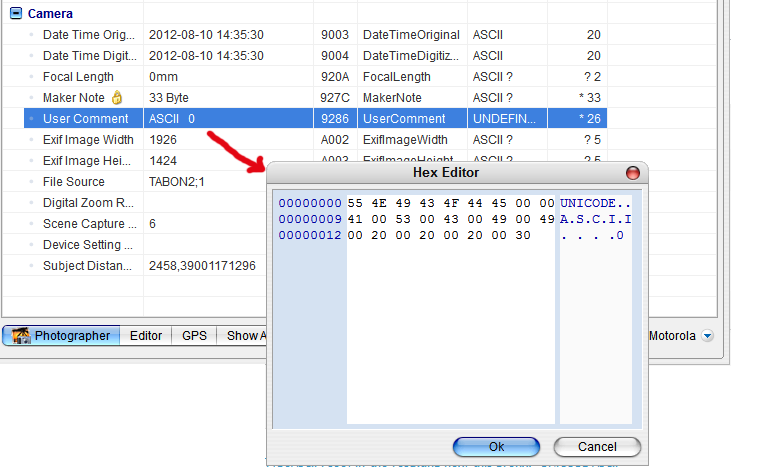 Perhaps I'm doing something wrong, but if I try to set the tag as TagType.TagTypeUndefined, no value is saved at all. But if I use a TagType.TagTypeASCII I see, in the resulting hex, this prefix: "UNICODE ASCII". So, not only UNICODE or ASCII, but both of them. But if I use a TagType.TagTypeASCII I see, in the resulting hex, this prefix: "UNICODE ASCII"
Could you explain further how you process to get this result? Could you also attach an image with such data? I'm trying to use byte instead of string. The "ASCII" prefix is no more there, but the value is printed twice... Here, as example, with value = "491,678"
I can't understand why there is Unicode displayed. 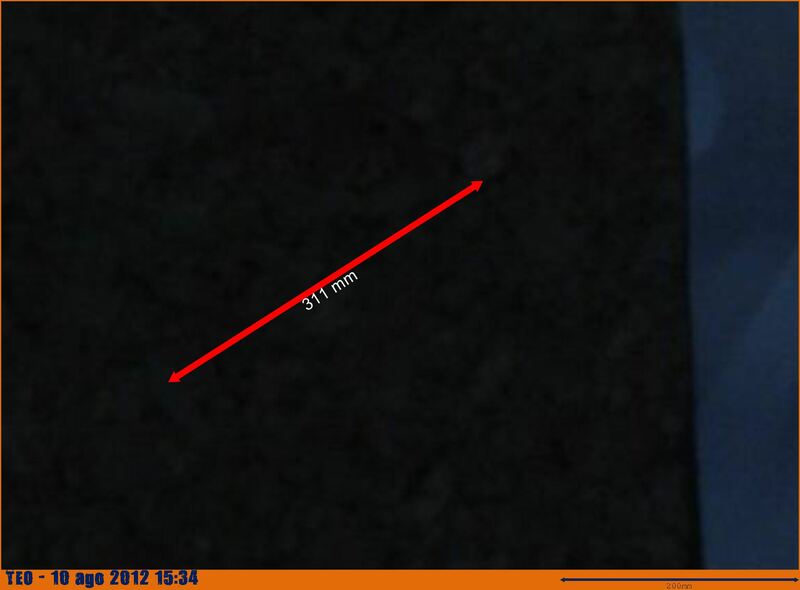 I think it can be a bug with Opanda Exif Viewer. I've checked the source code of GdPicture 7 and I don't find any possible problem. That said, as I asked before I really need a produced image from your side to advice more. In case you want to use the TagSetValueBytes, you have to provide an array of bytes that meet the specs, meaning with the 8 bytes of header. I thought about Opanda too, but Irfanview show the same, and even Windows file properties.